When former U.S. president William Howard Taft visited the first Knox Presbyterian Church at 142 Ontario Street, Stratford, Ontario, Canada, he is reported to have called the 211 feet steeple the “most graceful and pleasing” he had seen. 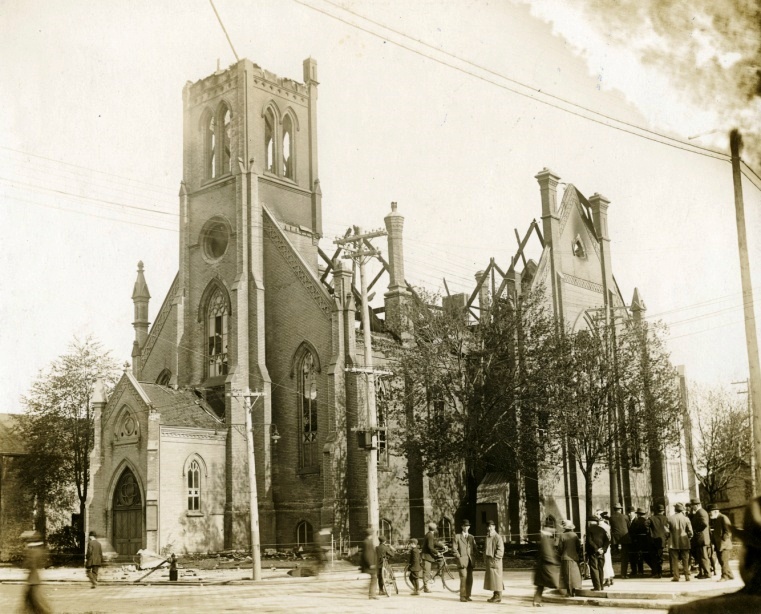 In the early morning hours of May 13, 1913, the church steeple was hit by lightning as an electrical storm passed over the area, igniting a fire that quickly spread, destroying the sanctuary, and engulfing the roof and steeple. When firefighters attempted to battle the flames, their hose streams were unable to reach the top of the steeple. 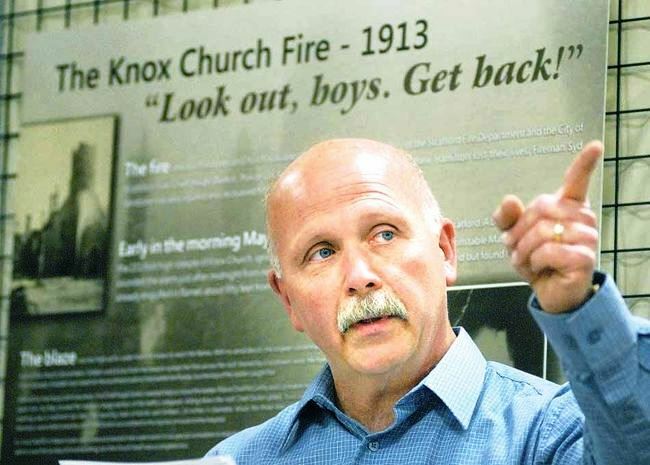 A ladder had been placed in an attempt to gain control of a fire in the roof, and Fire Chief Hugh Durkin, Police Chief John McCarthy Jr., and Constable Matthew Hamilton were endeavouring to move the ladder into position on the west side of the church when the steeple came crashing down. All three men were killed in the collapse, and a fourth man, firefighter Syd Vanstone, was badly injured. Note: In the late 19th century, firefighting was done with the assistance of a team of horses, and the department was not fully motorized at the time of the fire. On May 13, 2013, the 100th anniversary of the fire, the three men who died were honoured during a ceremony at the Stratford-Perth Museum. 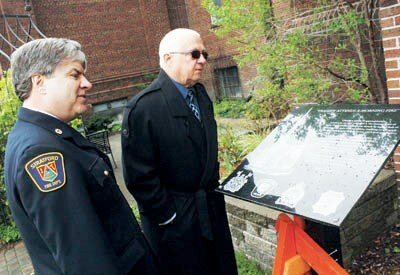 Following the service, a plaque was unveiled in the garden area in memory of the three men. The sacrifice made by members of the Stratford Fire and Police Departments, in the battling of the fire at Knox Church. 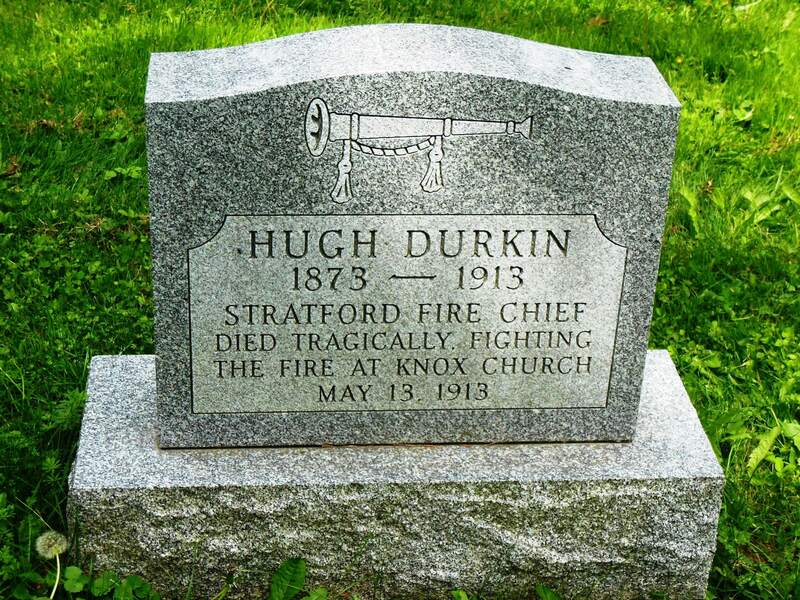 Hugh Durkin was only 39 on May 13, 1913 when the steeple of Knox Presbyterian Church came crashing down. 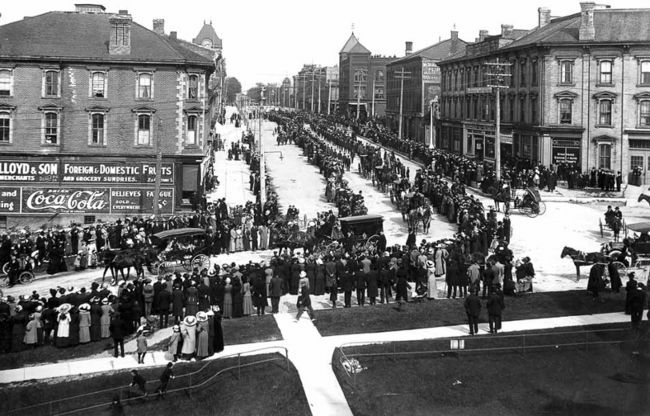 After his funeral and long public procession through the downtown streets of the city, Durkin, a bachelor, was laid to rest in Lot 13 of St. George’s section at Avondale Cemetery, next to his father Michael who had died seven years before. A gravestone was never erected for the fallen fire chief and speculation is that it was a monetary issue on the part of his immediate family. When this recently came to the attention of the current fire department, Durkin’s family members took action to remedy the oversight. 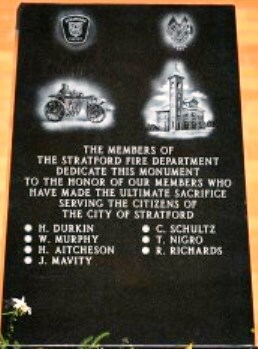 Stratford Memorials donated a grey stone with the depiction of a typical bugle used by fire chiefs at the time to shout orders to their firefighters. The Stratford Professional Firefighters’ Association is contributing to its care and maintenance. Durkin was an accomplished horse rider and was described as a “courageous, daring and efficient firefighter.” He was buried on May 15, 1913 in Avondale Cemetery Section St. George, lot 13. Constable Hamilton had been on the force for five years, and as the night policeman he discovered the fire and raised the alarm at 12:35 a.m. He was described as a constable who would go out of his way to help someone rather than simply throw them in jail. He was 46 years old when he was struck with debris during the collapse of the church steeple. He was buried on May 15, 1913 in Avondale Cemetery Section R, lot 49. CHIEF JOHN AUGUSTUS MCCARTHY JR. The Chief followed in his father’s footsteps as Stratford’s chief constable. He started his career as a county constable, and later a town constable under his father. In 1883 he was employed as a detective on The Grand Trunk Railway and was known for his clever detective work. He was appointed Chief of Police for the city of Stratford in 1888. He was 66 when he died and was buried on May 15, 1913 at Avondale Cemetery Section H, lot 44. 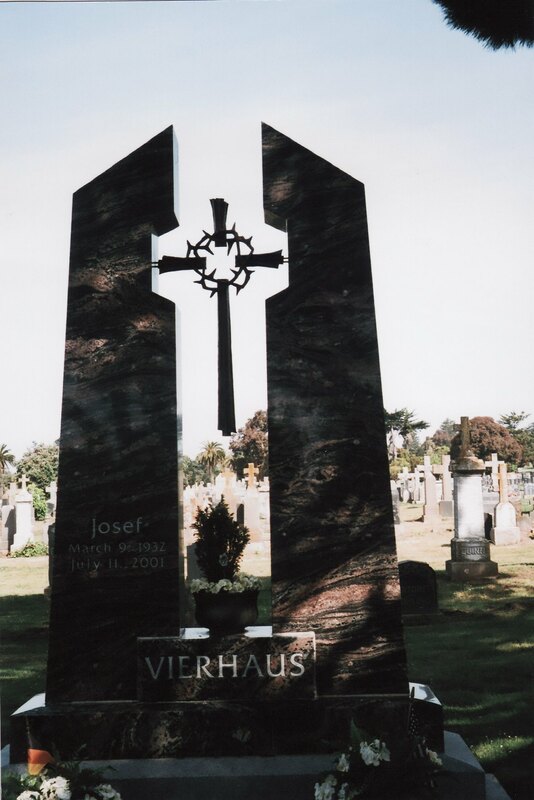 His grave can be found halfway down the hillside behind the chapel in Block H. It is a grey granite square with a horizontal, round pillared top. 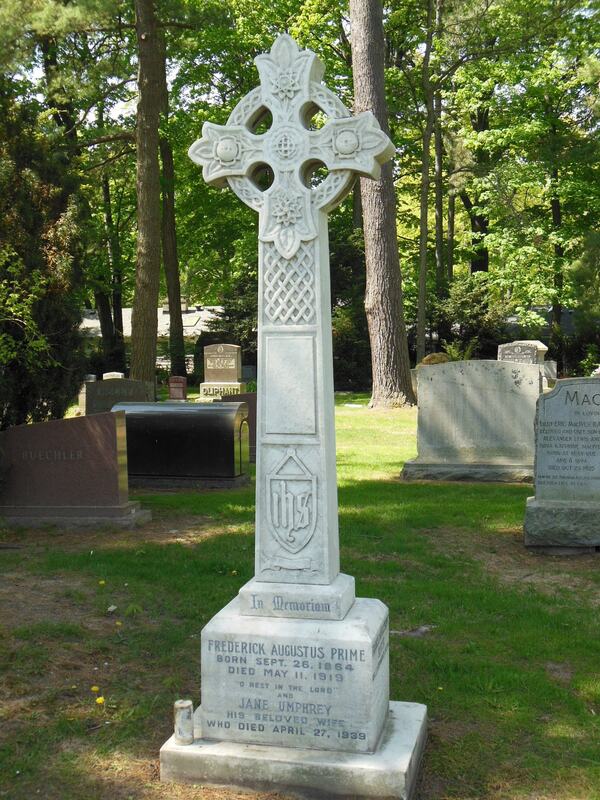 Here lies John A. McCarthy Jr., Stratford Police Chief who died fighting the Knox Presbyterian Church fire in 1913. 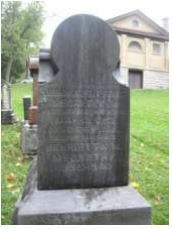 Avondale Cemetery, 4 Avondale Avenue, Stratford, Perth County, Ontario, N5A 6M4, Canada. The Celtic cross is a Latin cross surrounded by a circle. Its origin can be traced to the Celtic cultures of the British Isles. A legend tells of St. Patrick preaching to heathens when he was shown a sacred standing stone marked with a circle (symbolic of the moon goddess.) St. Patrick made the mark of a Latin cross through the circle, and blessed the stone, thereby creating the first Celtic cross. In pagan times, this cross with its axis enclosed by a circle was a symbol of fertility and life, the cross representing male potency, and the circle, female power. Prevalent in Ireland, it is now primarily a Christian symbol signifying the unity of heaven and earth. This symbol incorporates the letters IHS which is a monogram of the Greek word for Jesus. The circle is a symbol of eternity and God’s endless love through Christ’s sacrifice on the cross. It is often richly decorated with Celtic knot work. An Ionic cross is very similar, but its ends flair outward. This Celtic cross is created using a Botonee cross, named because of its modified trefoil (three-lobed) ends. It represents the Trinity of the Father, Son and Holy Spirit. A modification to the Celtic cross is this addition of the Irish Claddagh symbol. A symbol of enduring love, the two hands represent friendship, the crown signifies loyalty and lasting fidelity, and the sign of the heart symbolises eternal love. This stone clearly belongs to a Christian woman. 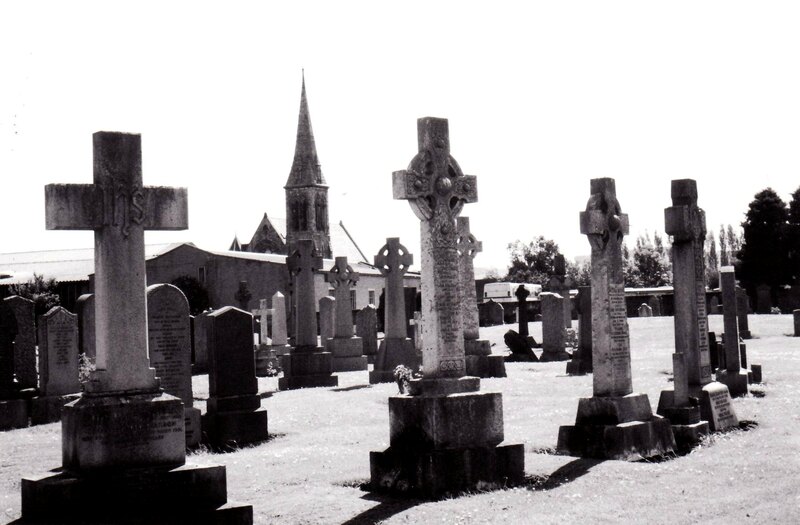 The Celtic Cross has multiple symbols all within a circle which represents eternal life. The six points of the star relate to the six days of creation and also represent the six attributes of God: power, wisdom, majesty, love, mercy and justice. In the center of the cross is the symbol IHS which is a monogram of the Greek word for Jesus. The cross symbol has four arms of equal length. It is the traditional symbol of Christian faith. On the left arm of the cross is a monogram of the first two letters of the Greek word for Christ: XP. Known as the Chi Rho one letter is superimposed over the other. It is one of the earliest Christian symbols. The symbol on the right is Alpha and Omega, the first and last letters of the Greek alphabet, also represents the beginning and the end. 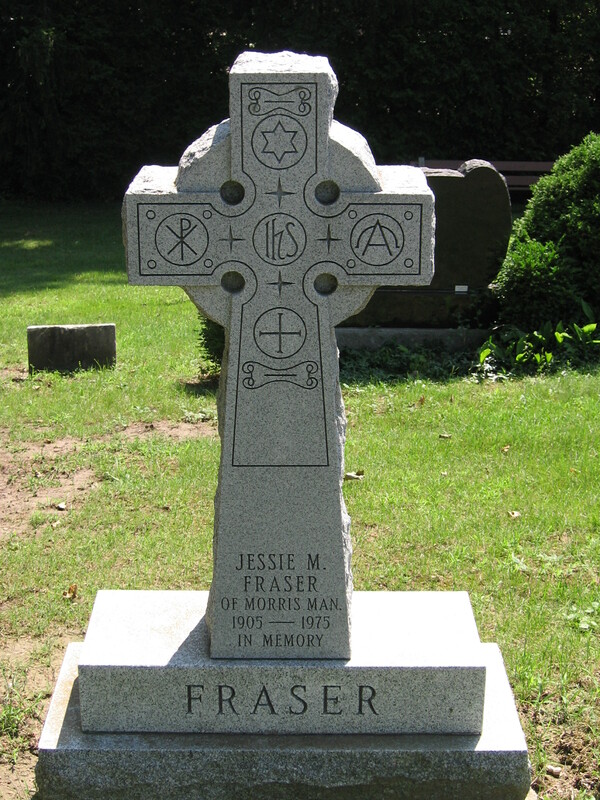 This memorial is a stylized Celtic cross. The circle is a crown of thorns. The message is biased towards Christ’s crucifixion rather than the resurrection.